This crazy story happened a few blocks from me! 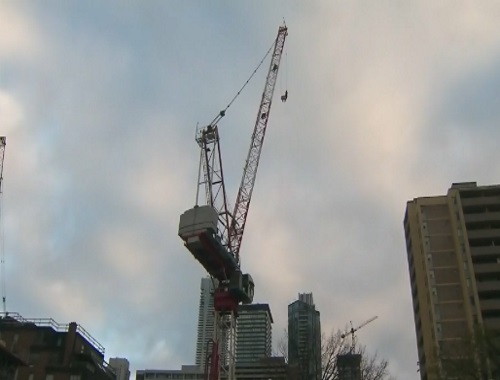 A woman climbed up to the very top of a boom of a crane at downtown Toronto construction site. Then managed to lower herself down a cable onto a block of the crane's hook. She was stranded for four hours before being rescued by officers. It is still not clear why she decided to climb up the crane in the first placem the woman is cooperated with police in their investigation but he refused to provide any other details on her motive. She was placed in handcuffs when she reached the ground. Apparently she will be facing 6 counts of public mischief by interfering with property. Click here for the CTV News story.